Editors Note: There is a photo and video associated with this release. Cantech Letter and Cambridge House International are pleased to announce that the first annual Cantech Investment Conference which will take place January 16 at the Metro Toronto Convention Centre. 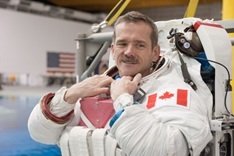 Canadian icon Commander Chris Hadfield will deliver the keynote speech entitled "The Sky is Not the Limit". The Cantech Investment Conference will feature a premiere collection of thought leaders from established publicly listed tech leaders to startups, and will be the first event of its kind to present both institutional and individual investors to opportunities in Canadian technology investing. "This is the most exciting time in more than a decade for Canadian technology," says Cantech Letter Founder and Editor Nick Waddell. "The Cantech Investment Conference will give Canadian tech investors and enthusiasts the opportunity to connect with the absolute best in Canadian technology, across all innovation sectors." Cambridge House CEO Jay Martin says the idea for the Cantech Conference came from demand at the grassroots level. "Canada has become known for having the top technology talent that can rival anywhere on the globe, but the industry has to come together to make something big happen. And that is the intention of this conference. Cambridge House Conferences connect people, build relationships and grow businesses. We're seeing a huge demand from everyday investors for more technology offerings and we're thrilled to be partnering with Cantech Letter on this project." The Cantech Investment Conference will take place 9:00am to 5:30pm at the Metro Toronto Convention Centre. The day will conclude with a gala, invitation only dinner where the Fourth Annual Cantech Letter Awards will take place. Cantech Letter Founding Editor Nick Waddell and Cambridge House President Jay Martin will ring the opening bell at the Toronto Stock Exchange the following morning with the award winners. Founded in 2008 by Nick Waddell, Cantech Letter is an online magazine dedicated to Canadian tech stocks and startups. The site features contributions from some of Canada's top technology analysts and thought leaders. About Cambridge House International Inc. Founded in 1995 Cambridge House International Inc. has grown to be the world leader in producing investment conferences held throughout North America. Cambridge House Conferences bring industries together for impactful two-day events where attendance includes novice to expert retail, accredited and institutional investors. The conferences are a monumental place for networking, education and investment discovery. About this company Cambridge House International Inc.